Even the pros crash. When it’s your turn to spill the Enduro Engineering Radiator Braces will keep your bike in one piece. Enduro Engineering has made their radiator guards from strong, lightweight aluminum alloy that keeps weight down and strength up. The rad guards are one piece construction that mounts directly to the frame to form a cage around the radiators to protect from front and side impacts. Installation is simple with the included hardware, and once finished the guards will fit snugly underneath your plastics to maintain the original factory look. easy to install and so far, has kept radiators in one piece. seems to cover what is important...not worried about stuff flying up into radiators. Not light weight, but that is the price for good protection. EE products all seem well built and designed to function and that is a beautiful thing. Awesome braces, not so awesome instructions. I used some alternative means (dimpled washers) for a tighter fit. Overall tgese are great armor. I purchased with EE guards. I've got an 08 250 sx. Bought these as a little insurance against radiator damage. Also bought the mud gaurds to go with these braces. They fit perfectly and look pretty trick. Very heavy duty construction and the rubber straps for the gas tank shrouds make it a lot easier to remove the tank for cleaning and service. Bought these rad guards for my 250 XCW. The setup is lightweight and strong, virtually no way to damage the radiators now. The hardware is solid & sturdy. Had these on my other bike for years with no issue. The installation is pretty straightforward which is good because the directions are pretty worthless. Absolutely essential protection. I wont ride a bike without these. A busted radiator will leave you stranded. Dont be that guy. Takes a good while to mount these on due to the tight fitment. Some of your wiring may need to be moved and adjusted to accommodate the guards. Use loctite. Okay protection but there are better options. My radiators bent and twisted using these so I wasn't very impressed. Perfect fit sturdy and pleasing to thee eye. Biggest positive is the spacing between guard and radiator which is important to allow for dirt to fall through and make clean up easy. I watched in horror as my son's new ktm 150xc slowly tipped and smashed onto the edge of the trailer. The plastic and radiator taking a direct hit. Plastic was badly cracked but to our amazement only the aluminum tab was bent on the radiator. The brace absorbed the hit - saving our ride for the day! These guards have saved my radiators more than once. Good fit. Fairly easy to install. A must have. put these on before you have any bends in your radiator! Once they are bent, it becomes a power struggle to get them to fit. Otherwise these are not that hard to install but be forewarned that you will have to modify your aftermarket "Trail Tech" fan and temperature readout in order to get the guards around the fan housing. I used a Dremel with a cut off wheel to "saw off" the temperature gauge housing and then reattached it to the guards with a zip tie. I have used these on several bikes now and they always perform well. Fitment has never been an issue and they seem to hold up well. I installed the braces on a 2014 KTM EXC 500. 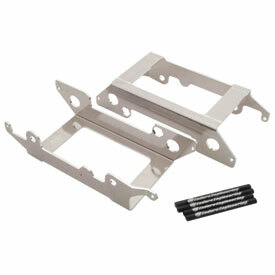 Overall, they are built very well and look like they will provide excellent protection for the radiators. I also installed the EE radiator quards for a total protection package and the combination of the two products look to add additional rigidity. I haven't crash tested them yet so I can't comment on that aspect. My only gripe is that the instructions are all jammed onto one page and are tough to see clearly and when I viewed the installation video on the EE web site, they used a XC-W as the example which doesn't have the wiring that the EXC has. Not too big a deal., you just need to re-route a couple of wires so they don't get pinched between the frame and the brace. Overall fairly simple to install. These really save your radiators when you fall. It keeps the cores from being dented in causing damage to your radiators. I have had these on the last two KTMs that I have had. Great addition to any bike. Will pay for itself. These guards seem to be built extremely well. I purchased these guards to go with my new Mylers radiators for my 2013 KTM 500 XC-W. These will not fit without significant modification. I was not aware that they do not fit until after opening the package and attempting to install. Downside to that is they are no longer returnable at that point. I found out later that there are specific guards for those radiators, but are about $200 (ouch). I have other Enduro Engineering products on my bike, and am pleased with those. Nothing against these guards, other than they just don't necessarily fit aftermarket radiators. I'm sure they would fit factors just fine, but mine are too bent to bring back to life I don't think. Rock solid, radiator guard. Use them on KTM 2 and 4Ts , great fit, easy install, even accomdates fan kit for 4Ts, with minor adjustments. Use in PA, NY, WV rocks and never had an issue with damaged radiators. I want my bike to last and the more protection I have on the more costly parts the better. They are strong and not too heavy. The installation is sort of a pain. They were a good price but what is a day riding worth? Not too thrilled that they are two piece braces and bolt together. If I were to buy another set I would get the KTM, Husqvarna steel guards. IMO they are solid and may protect better. Also not thrilled about the rubber bands they supply to secure the radiator shrouds. Minor trimming of the shrouds and was able to bolt them back on and still looks good. save the rubber bands as spares for the kick stand. I also had trouble installing the Trail Tech Digital fan kit, NOT a direct bolt on with these guards. Minor adjusting of the fan bracket and bolting it to the radiator brace looks good still and works as it should. I bought the bike with these on and they are terrible. I've gone through 3 radiators with these and they have done nothing to prevent side impacts. Whenever I have fallen over they have bent and hit my radiators. Then to top it all off, they extend too close to the frame and rubbed a couple of the wires in the wiring harness for the electric starter in half. Not my favorite product at all. Seem good and sturdy but a pain in the wiskers to put on. It took me about 30 minutes. Read the fine print. Only KTM Fans Fit. Typical EE product. Well thought out and easy to install. But... It only works with the KTM fan kit. I just saw "Works with fans" and charged ahead only to realize that it does not work with Trail Tech fans that have a digital read-out. I had to modify the crap out of the right outer brace, but I made it work with only 3 tie-in points vs. 4. I will report back on the durability of the modified side. The design of guards seem to offer good protection, but it was clear at about halfway through the installation that the plastics would not fit back into their original mounting location. The guards are much larger than the space offered by KTM, so the bolt holes for mounting the shrouds at the radiator don't line up with anything. To compensate for this Enduro Engineering uses rubber bands to attach the shrouds at the radiator. Unfortunately the packaging doesn't utilize any pictures or instructions for installation without having to purchase and open the vacuum wrapped parts, so I really had no idea how it went together until I started installing it. My concerns were that the top shroud bolt would have to be removed to allow installation and that the shrouds would flap around while I was riding. There will be needed movement of existing wires and the plastics are a little tight but over all I am happy with what I got. These are doing good work on my bike. I race XC and rocky stuff a lot and I fall a lot......No shame here!....These things protect! GET YOU SOME!!! Seems to be built well for the price. I don't have unlimited funds so this seemed to do the job within my budget. These are a great price, fit well, and quick to install. I really like the EE products, I have the handguards also, and they are made in USA! Best Radiator Protection on the market. Best Radiator Protection on the market. Period. Exclamation point. I purchased these 120 hrs ago. They have held up well. I hill climb and ride single track and show no mercy on this bike. I've destroyed two sets of plastic radiator shrouds and the radiators look excellent. I've tried the works connection braces and they broke and bent the radiators on my previous bike.The plastic shrouds do not fit as well, but in my opinion the struggle getting the holes to line up is well worth it. Installation was a little harder than expected, instructions were not clear enough in regards to bolt specification, but the product fits well, and seems like it will protect the radiators from most impacts. A little difficult to install on the right side with an FMF Gnarly pipe, just due to the lack of room but overall pretty simply to do. Enduro Engineering also has a great video on their website and youtube for the install. Fits perfect w/ stock set up and the elastic straps to save your plastic are an excellent edition. Don't wait until you crack a radiator to think about getting these. My biggest pet peeve is looking down at a bent radiator... I have had these on for a year now and while I don't let my bike roll down mountains on crazy trail rides, I have had some occasional tip overs and a nasty crash at the track that sent my bike tumbling. The braces did their job and my radiators are straight. They add a small amount of width to the bike (not notable while riding) but it makes getting the shroud bolts in a tough job on the ktm. With someone to help they go in fine. Look guys, these are terrible. These are difficult to install (compared to other brands) and they barely offer any protection. Additionally they make your radiator slightly wider and screw up the fit of the radiator plastics. The radiator itself is stiffer in the crashing direction than these silly bent sheet metal devices which appear to be made of some very soft aluminum (not even 6061 quality). I bought this after I had already partially crushed both radiators, It took about 15 minutes longer than it should have to install (due to damaged rads) but it works very well. I've crashed many times after installation, landing on the rads and they are just as they were when I installed. These things are sturdy and well machined. very nice. Haven't crashed yet so don't know if they will hold up. No doubt this protects your radiators very good. I have cartwheeled it and held up well. The instructions are terrible and it requires modifications to get shrouds back on. It also distorts them so they will break easily. If you are cool with that, this is good for you. I have since moved on to other brands I like much better. These things went on without a hassle. The look great and are made of a 1/4 inch planting. And they have a crash proof warranty. I also have a skid plate from these guys, also great. They know how to build protective parts. These offer good protection at a good price. Their might be better guards available but not for the price. Enduro engineering makes a great product and have great support. If you ride in the woods or the desert these are a must have , you do not want to left out in the middle of now where with a crushed radiator, easy to install. This is the 3rd KTM I've put this brand of braces on and the radiators still in perfect shape. bought my first set for the 2012 model. it was a little bigger then and the fit was a little odd. the new version fits nicely over the radiators and the plastics go on without any problems as well. if you don't want to attach the plastics to the old holes, you are provided with rubber strings to pull them to the other side of the brace. it works either way and a bike saver in the Australian rocky terrain which is my new home. Fit great. Easy enough to get on. Just fiddle w/ the rads a bit. Good protection but you have to remove rad. to mount. The 2nd gen. of these guards will be able to mount without removing the rad. Should make a big diff in the installation. Otherwise another good product from Enduro Eng. Cheap insurance easy to install well made. I just bought another set for my 2014 KTM 500 xc-w great product. Will my SRT radioator guards still fit with the addition of these braces? They will fit but they will have to be modified. I put the braces on my Husqvarna TC125 and everything fit perfect. I'm not sure about the SRT. Do i have to have the fans already to install these braces? Or can i plan ahead and install these then purchase fans in future? These braces do not require the fans to install. You can install them and add fans later. I already had the fans and had to loosen them a bit to maneuver the braces in place. Not having fans will make for even easier installation. Good luck. I installed them, with fans and had to make some minor alterations for the one KTM fans for my 08’ XC-F 450. Great guards though, really like them! Braces can be installed with or without fan. Can add fan at a later time. You can install and add the fans later. You can add the fan later. do you have to drain coolant to install>? BEST ANSWER: mine came as a two piece design you have to unbolt the radiators but did not have to drain coolant. No! If you remove the side panels and pre assemble the inside brace you can sneak it in that way. Most models do not require you to drain the coolant. What is the Enduro Engineering part number for these braces? Will these fit a 2018 KTM XC-W TPI? Will I receive the newer, 2-piece model similar to what is shown on the EE site? BEST ANSWER: Yes, all of RMATV's inventory is the newer two piece design.